Latin Trails' roots in Ecuador's tourism industry began in the early 1980s, as the family-run business hosted international visitors for two decades. In 2003, they launched Latin Trails. Latin Trails took the family's land-based knowledge and partnered with Botto shipyard to build the company's first catamaran, Journey I in 2006. Passengers liked the ship, which better suited travelers who had never set foot on a catamaran before. Seaman Journey replaced the original Journey I and the company launched its yacht, Sea Star Journey, in 2011. The company prides itself in being a forerunner of sustainable tourism and has been certified by TourCert.org for both its eco and socially responsible tourism practices. A 16-passenger luxury motor yacht, Galapagos Sea Star Journey offers authentic expedition cruises around the Galapagos Archipelago. It is owned and operated by Latin Trails. Latin Trails, a family-run company with deep roots in Ecuador and the Galapagos Islands, operates two ships in the Galapagos, including the 16-passenger, first-class motor catamaran Galapagos Seaman Journey. If you're not already friends with your fellow passengers when you embark a Latin Trails Galapagos sailing, you soon will be. With just 16 passengers on each of its ships, Latin Trails fosters a sense of camaraderie that's hard to come by elsewhere. Nearly everyone onboard has an adventurer's soul and is passionate about viewing the local wildlife while being ecologically responsible. Passengers form strong bonds with the crew and onboard naturalist, making each voyage special. Latin Trails has an open bridge policy, which means that passengers can visit with the captain at nearly anytime. (The bridge may close at certain times or when the weather is challenging.) Standing on the bridge is a unique experience, and you can learn much from even a brief conversation with the captain. The pace onboard is laid-back and the order of the day is enjoying the scenery and keeping your eyes peeled for wildlife sightings. Most people hang out on deck while sailing and enjoy the sun deck and outdoor lounge. Those inclined for quiet time gravitate to the indoor lounge or library. While most activities revolve around nature, Latin Trails also offers onboard activities such as learning to make ceviche. Most everyone participates in each included excursion, which may include a Zodiac tour of the coastline, snorkeling or a hike ashore. Afterward, passengers enjoy communal dining with meals served family style. (Breakfast and lunch are usually buffet style.) Expect plenty of accessible Western dishes plus Ecuadorian favorites like seco de chivo (lamb stew), shrimp ceviche and coconut fish with rice. Some private dining areas are also available for couples. The indoor restaurant is air-conditioned and there is also alfresco dining space on deck. Special diets can be accommodated with at least 15 days' notice. Each ship offers complimentary snorkel gear, four twin sea kayaks and Zodiac excursions. Wet suits are available for rent. The cruise fare includes transfers from Galapagos airports to the ship, all excursions, complimentary snorkel gear plus unlimited water, tea and coffee. You'll pay extra for wine, cocktails and soft drinks. Gratuities are not included. Factor in $10 per day for the guide and $25 to $30 per day for the rest of the crew combined. Latin Trails draws educated travelers who've been all over the world and are finally checking the Galapagos off their bucket lists. 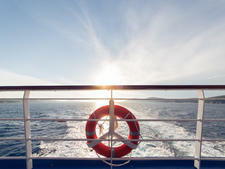 Most passengers are in their mid-50s, though the voyages also draw younger couples and families. People from all over the world book Latin Trails itineraries, which leads to a multicultural feel throughout the cruise. The crew and naturalists are bilingual, speaking English and Spanish. 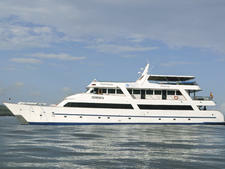 Latin Trails sails two purpose-built ships: Galapagos Seaman Journey and Galapagos Sea Star Journey. Both vessels welcome 16 passengers per cruise. The company launched Galapagos Seaman Journey, a first-class motor catamaran, in 2008. Its high-end public spaces include an indoor lounge and dining room, an alfresco dining venue and upper deck lounge; bow nets for lounging and watching dolphins; a teak sun deck with daybeds and loungers (some in the shade); and a boarding area at the stern where you can change into wet suits before an excursion or simply sit and watch the water. The catamaran is equipped with four twin sea kayaks and two Zodiac landing craft for daily excursions. Cabins, each of which is approximately 161 square feet, are air-conditioned and feature ocean views (the windows actually open as well), firm orthopedic mattresses, a small writing deck, closet and private bathroom. Six cabins are configured with two fixed twin beds and one cabin has a queen bed. If you're traveling with a child, you can request a sofa bed. Eight crew members and one naturalist man the ship. Latin Trails has an aggressive maintenance schedule with the ship going into dry dock every other year. Seaman Journey's last refurbishment was in 2015 with its next dry dock scheduled for December 2017. The line's other ship, Galapagos Sea Star Journey, is the one to pick if you're looking for luxury, having been custom designed as "one of the finest expedition yachts available on the planet" (so the cruise line says). The ship was built by hand in Guayaquil in 2011, using top-of-the-line marine steel. A master carpenter worked throughout the ship to install teak flooring on the outside decks, amarillo decking for interior floors, and seike -- a locally sourced tropical hardwood -- for bed frames and furniture. Sea Star Journey features an indoor lounge for evening lectures; it's outfitted with a coffee and tea station. There is an indoor dining room, a small library with a kids' corner, an alfresco dining area on the stern plus an upper deck lounge and a sun deck with two hot tubs plus daybeds and loungers in both shade and full sun. The ship is stocked with snorkel gear and has twin sea kayaks for each cabin so all guests can take part in outings at the same time. Two Zodiacs are available for excursions and landings. The yacht features seven 269-square-foot Galapagos Suites, each with two twin beds that can be converted to a king, and one Sea Star Suite, which is 377 square feet. Each cabin has panoramic windows, private marble bathroom, air conditioning, a mini-bar, flat-screen TV with DVD player, and a sofa bed that can accommodate a child or teenager. Connected suites are available for families. Eleven crew members cater to Sea Star Journey guests. The ship was last overhauled in 2015 and its next dry dock is slated for August 2017. All Latin Trails voyages focus on the Galapagos Islands and sail between Baltra and San Cristobal or Baltra round trips. Seaman Journey offers three main itineraries that range from four to seven nights, which can be combined for a longer voyage of up to 14 nights. Sea Star Journey offers three main itineraries that are four or five nights in length and can also be combined for a journey of up to 14 nights. Itineraries include the most compelling sights in the Galapagos, including visits to the San Cristobol Interpretation Center and Charles Darwin Research Center and to the islands of Espanola, Isabela, Fernandina, Floreana, Santa Fe, South Plaza, North Seymour, Santa Cruz, Sombrero Chino, Genovesa, Bartholomew, Santiago and Mosquera.